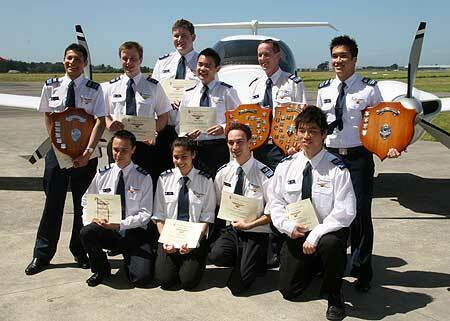 Bachelor of Aviation – Air Transport Pilot students who received their Wings yesterday. Back row, from left: Mohamed Reza Bin Mohammad Ali, Robin Parsons, Rupert Robertshawe, Kam Hei, Paulson Yiu, Christopher Head, Cendra Perkasa; front: Donald Sabanal, Jenna Arriola, Ivan Campbell and Kin Fung (Jason) Cheung. 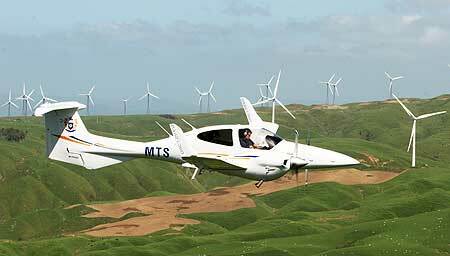 The University's School of Aviation yesterday welcomed the latest additions to its fleet – two Diamond DA42 twin-engine aircraft that complete the $8 million 14-aircraft purchase announced last year that put the school at the forefront of international aviation training. The official handover of the aircraft from the University Vice-Chancellor Steve Maharey to the school general manager Ashok Poduval was held at the Milson Flight Systems Centre at Palmerston North Airport. It coincided with this year's Wings graduation ceremony for aviation students who have qualified as pilots as part their degree programme. Senior officers of the Royal New Zealand Air Force and the Royal New Zealand Navy were present, and guest speaker was Air Vice-Marshal Graham Lintott, New Zealand's Chief of Air Force. Air Vice-Marshal Lintott said he was very pleased with the developing relationship between the RNZAF and the University, and the school in particular. I'm very proud to have a number of Massey graduates flying for both the RNZAF and the Royal New Zealand Navy." The DA42 has the same cockpit display systems, Garmin 1000 avionics, as the single-engine DA40 aircraft, which will make the transition training from single-engine to twin-engine aircraft simpler. The aircraft are also equipped with the latest technology, such as moving map displays and terrain avoidance warning systems. Mr Maharey told the students the degrees they are studying for are highly-regarded worldwide, and he was proud of the programme and the people involved in aviation at Massey. Mr Poduval says the arrival of the twin-engine aircraft makes Massey the only provider of aviation training in New Zealand with a full fleet of glass cockpit aircraft. The planes are known as TAAs, Technically Advanced Aircraft, by the United States Federal Aviation Administration, he says. The School of Aviation was established in 1990. It is part of the College of Business and is also a certified flight-training organisation, has ISO 9001-2008 accreditation, and holds an equivalence approval from the New Zealand Civil Aviation Authority. It is the only flight-training organisation that holds such an approval, under which students are exempt from the requirement to pass the professional licence examinations for issue of licences by the authority and the University exam results are accepted in lieu of those. Flight examiners from the school are approved for conducting flight tests for the issue of licences. The school is one of the few institutions in the world that offers degrees in aviation with integrated professional pilot training. It also offers aviation management programmes at undergraduate, postgraduate and doctoral levels. Graduates are employed in numerous airlines and aviation organisations worldwide. There are currently about 200 students studying in the Bachelor of Aviation Management programme and about 90 studying for the Bachelor of Aviation – Air Transport Pilot degree. There are 28 postgraduate students and 10 PhD students.